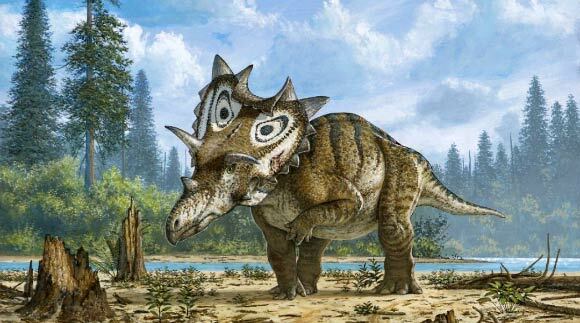 In May (2016), two new horned dinosaurs were discovered, and today we will talk about one of them. 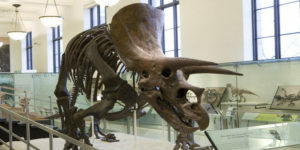 Horned dinosaurs, like Triceratops and its relatives, are called ceratopsians (meaning ‘horned faced dinosaur’), and are divided in to two groups: Chasmosaurines and Centrosaurines. Chasmosaurines have short nose horns, long eyebrow horns, and a long, but less decorated frill. Triceratops is a chasmosaurine. Triceratops at the American Museum of Natural History. 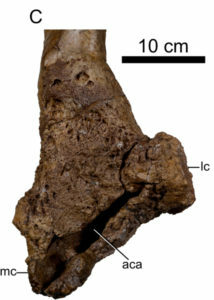 Centrosaurines have large nose horns, short eyebrow horns, and a smaller, but more decorated frill. 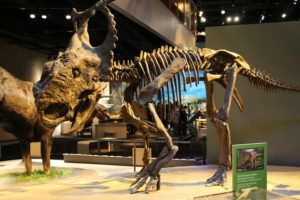 Pachyrhinosaurus from the Perot Museum in Texas. This week, an [article] was published that described a new centrosaurine from Montana, USA. This new dinosaur is named Spiclypeus shipporum (Spiclypeus meaning ‘spike shield’ for how the frill looks, and shipporum in honor of the Ship family). 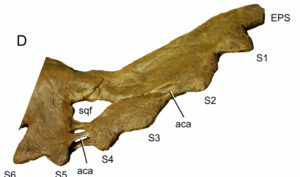 Spiclypeus is a really cool looking new centrosaurine, but its bones also tell an interesting and sad story. Much like the Dilophosaurus we talked about a few weeks ago, this Spiclypeus shows signs of having multiple diseases in life. Even though it is impossible to say for sure what happened, the authors think that while this Spiclypeus was fighting with another individual, it was sharply poked with its opponent’s horn, leaving an open wound in its frill. This wound got infected and lead to the formation of a different type of bone. Figure 8D from the paper showing abscesses in the frill (labeled ‘aca’). This Spiclypeus also shows signs of a long-term infection in its humerus (upper arm bone) that would have made walking very painful. Figure 12C from the paper showing abscesses (labeled ‘aca’) in the humerus (upper arm bone). This dinosaur would have been 7-10 years old when it died. So even though it was probably an adult when it died, Spiclypeus would have had a short unhappy life.